Chlorophyll a is the a green photosynthetic pigment found in most nearly all plants, algae, phytoplankton, and cyanobacteria. Chlorophyll a is measured and reported as the number of micrograms per one liter (µg Chl a/L) of water. It is a light harvesting pigment that turns photons into energy which is used to fix carbon into sugars. Water column chlorophyll a concentration is correlated to phytoplankton biomass. There are other chlorophylls and accessory pigments that also contribute to sugar production that absorb additional wavelengths of light, thus maximizing the use of light from our sun. One key characteristic of chlorophyll is that when irradiated with light of a particular wavelength, it emits light of a higher wavelength (or lower energy). Because of this property chlorophyll can be measured using a fluorometer. 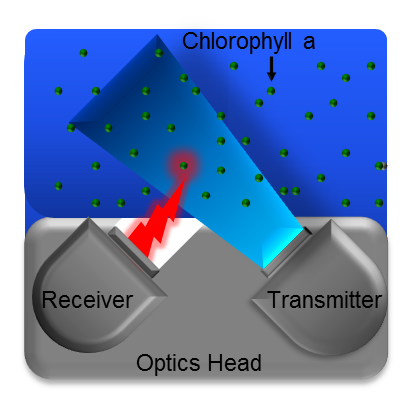 A fluorometer works by inducing chlorophyll to emit photons by shining a beam of blue light of the proper wavelength out into the water column, and then measuring the higher wavelength red light which is emitted as a result of the fluorescence process (see http://en.wikipedia.org/wiki/Fluorescence). Algal blooms are the result of an excess of nutrients (particularly phosphorus and nitrogen) and other factors. Chlorophyll a concentrations of 10 or less are common in low nutrient waters, such as the Gulf of Mexico. When Chl a reaches 40 µg/L, it is considered a bloom. Blooms indicate that nutrients are being supplied in excess. High phytoplankton (or Chl a) concentrations are detrimental to benthic producers like seagrasses because the phytoplankton reduce dissolved oxygen concentrations and light reaching the sea floor. Chlorophyll a concentrations of 100 µg/L or more may cause fish or invertebrate kills. Blooms of some phytoplankton, like Red Tide, or, Karenia brevis, synthesize and release toxins which inhibit critical physiological functions in plants and animals.